The Connecticut Beekeepers Association (CBA) encourages anybody interested in beekeeping to consider signing up for their Beekeeping School. Two Beekeeping Schools will be offered in 2019: one on January 12 at the Connecticut Agricultural Experiment Station, 123 Huntington Street in New Haven and another on February 2 at the Housatonic Valley Regional High School, 246 Warren Turnpike Rd in Falls Village. The school’s hours are 9am – 3:30pm and fee is $50. All the additional information and registration is available on the CBA website at ctbees.org/bee-school. 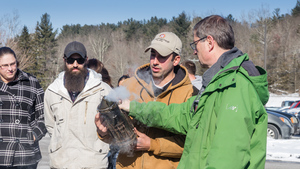 “We continue to see interest grow in beekeeping in Connecticut and this course provides an excellent opportunity for those who are interested in getting started to learn from experienced beekeepers how to successfully raise bees,” said CBA President Steve Dinsmore. The Connecticut Beekeepers Association has been serving Connecticut Beekeepers since 1891. Its purpose is to increase public awareness of the importance of honey bees for Connecticut agricultural crops and the environment and to promote and support all beekeepers and their local organizations. People interested in learning more about bees and beekeeping should visit CBA website at ctbees.org.